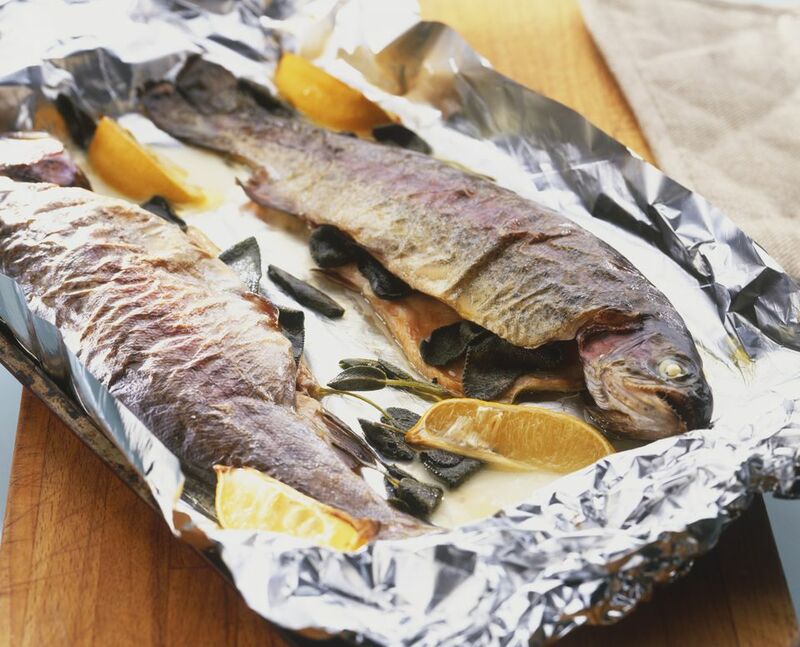 Rainbow trout, flavored primarily with dill weed and lemon, is baked whole in the oven. Once done, the fish releases easily from the bones. Although a whole fish comes with the head and tail intact, your local fish market will scale and gut the fish for you, leaving a clean opening where you can add seasonings, fresh herbs, and slices of lemon. Instead of filleting the fish in the kitchen before serving to your guests, present the fish whole at the table before you separate it into serving pieces for an impressive presentation. If you can't find or don't care for trout, other varieties of whole fish can be substituted. Heat oven to 475 F. Line a shallow baking pan with foil. Insert a flat baking rack into the pan. Rinse the exterior and interior of the fish under cold water and pat dry with paper towels. Slice one of the lemons into rounds as thinly as you can with a sharp knife. Lightly sprinkle the cavities of the fish with salt, lemon pepper, garlic powder, and onion powder. Stuff 2 to 3 sprigs of the dill weed into the cavities of the trout and follow with half of the lemon slices. Spray the entire skin of the fish with the cooking spray. Place fish on rack in the prepared pan. Spread remaining dill sprigs and lemon slices over the skin and top. Sprinkle lightly with paprika. Pour wine down the side of the pan to coat the bottom under the rack. Bake for 25 to 30 minutes, until fish flesh is opaque and flakes with a fork. Present the whole fish on a platter for your guests to admire before carving to serve. The flesh and skin should easily separate from the carcass. To serve, sprinkle the fish fillets lightly with paprika. Garnish with remaining lemon, cut into wedges, and a dill sprig.